Research on the impact of technology integration in colleges of education is often conflicting and rarely evaluated well. It therefore remains unclear which strategies are most effective for integrating technology in a teacher preparation program and how those strategies should be delivered over time. To better understand the effectiveness of particular strategies, researchers must begin by formally analyzing personal differences in preservice teachers' attitudes and abilities that may play a role in technology-related learning. This article reports on a year-long study conducted to explore the relationships between 62 preservice teachers' perceived computer ability and attitudes toward computers; two factors most associated with resistance to computers; and the impact of a single technology course on these variables. 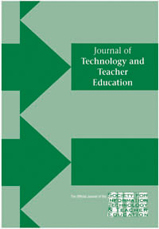 Utilizing a pretest posttest group design, statistical analyses indicated that a single course greatly impacts perceived computer ability but not general computer attitudes; that course instruction as well as prior technology experience has a significant influence on preservice teachers' ability to understand the usefulness of integrating technology in the classroom, and that student outcomes are strongly related to the use of particular instructional strategies that accommodate widely varying experience levels in learners. Lambert, J., Gong, Y. & Cuper, P. (2008). Technology, Transfer and Teaching: The Impact of a Single Technology Course on Preservice Teachers’ Computer Attitudes and Ability. Journal of Technology and Teacher Education, 16 (4), 385-410. Waynesville, NC USA: Society for Information Technology & Teacher Education. Retrieved April 26, 2019 from https://www.learntechlib.org/primary/p/26064/. Adams, N. (2002). Educational computing concerns of postsecondary faculty. Journal of Research on Technology in Education, 34, 285-303. Adamy, P., & Boulmetis, J. (2006). The impact of modeling technology integration on preservice teachers’ technology confidence. Journal of Computing in Higher Education, 17(2), 100-120. Albion, P. R. (1999). Self-efficacy beliefs as an indicator of teachers’ preparedness for teaching with technology. In J. D. Price, J. Willis, D. A. Willis, M. Jost, & S. Boger-mehall (eds. ), Proceedings of the Society of Information Technology and Teacher Education 10th International Conference (pp. 1602-1608). Charlottesville, Va: association for the advancement of Computing in education. Becker, H. J., & Ravitz, J. (1999). The influence of computer and internet use on teachers’ pedagogical practices and perceptions. Journal of Research on Computing in Education, 31(4), 356-384. Brown, D., & Warschauer, M. (2006). From the university to the elementary classroom: Students’ experiences in learning to integrate technology in instruction. Journal of Technology and Teacher Education, 14(3), 599-621. Ceyhan, E. (2006). Computer anxiety of teacher trainees in the framework of personal variables. Computers in Human Behavior, 22, 207-220. Delcourt, M. A., & Kinzie, M. B. (1993). Computer technologies in teacher education: the measurement of attitudes and self-efficacy. Journal of Research and Development in Education, 27, 35-41. Gunter, G. A. (2001). Making a difference: using emerging technologies and teaching strategies to restructure an undergraduate technology course for preservice teachers. Education Media International, 38(1), 13-20. Houtz, L. E., & Gupta, U. G. (2001). Nebraska high school students’ computer skills and attitudes. Journal of Research on Computing in Education, 33(3), 316-327. Kay, R. (2006). Evaluating strategies used to incorporate technology into preservice education: a review of the literature. Journal of Research on Technology in Education, 38(4). 383-408. Lambert, J. (2005). Technology integration expertise in middle school social studies teachers. Technology, Instruction, Cognition and Learning, 2, 261289. Mcrobbie, C. J., Ginns, I.S., & Stein, S. J. (2000). Preservice primary teachers’thinking about technology and technology education. International Journal of Technology and Design Education, 10, 81-101. Mims, C., Polly, D., Shepherd, C., & Inan, F. (2006). Examining Pt3 projects designed to improve preservice education. TechTrends, 50(3), 16-24. Pierson, M. (2001). Technology practice as a function of pedagogical expertise. Journal of Research on Computing in Education, 33(4), 413-430. Pitler, H. (2006). Schools’ untapped resource: technology for learning. Changing Schools, 52(1), 4. Ropp, M. M. (1999). Exploring individual characteristics associated with learning to use computers in preservice teacher preparation. Journal of Research on Computing in Education, 31(4), 402-424. Sanders, D. W., & Morrison-Shetlar, A. I. (2001) Student attitudes toward webenhanced instruction in an introductory biology course. Journal of Research on Computing in Education, 33(3), 251-262. Thorsen, C. D., & Barr, R. D. (1997, april). Computer competencies for teacher educators. In J. D. Price, K. Rosa, S. Mcneil, & J. Willis (eds. ), Proceedings of the Society of Technology and Teacher Education 8th Annual International Conference, orlando, FL. Charlottesville, Va: association for the advancement of Computing in education. Vrasida, C., & Mcisaac, M. S. (2001). Integrating technology into teaching and teacher education: implications for policy and curriculum reform. Educational Media International, 2-3, 127-132. Wiencke, W. R. (2002). Exemption exam for an introductory education technology course: Findings from two years of use. Journal of Technology and Teacher Education, 10(1), 112-130. Wilson, B. (1999). Redressing the anxiety imbalance: Computerphobia and educators. Behaviour & Information Technology, 18(6), 445-453.